Forlorn, Stuck on Muni Again . . . The subway broke again, so our streetcar is waiting patiently at West Portal. I wish Muni were more robust. They have always done well at providing shuttle buses when things are broken, but I’d rather depend on a system that didn’t need to be so adept with shuttle buses. “Okay, we moving now,” says the operator . . . I drove down to Mountain View yesterday and met Brian and Jessica for dinner. I also picked up the remote control for the TV Brian gifted us last year. He gave me another remote for the DVD player he also gave me last year, and then there was another TV remote that was nearly identical. We puzzled a bit, and then I realized that this other TV remote was for a TV I bought years earlier, and had traded to Joe for the TiVo he had won. Joe had lived with Brian prior to my living with Brian, and when he moved he must have forgotten his remote. There’s a talk thread on Yelp about Cohabitation. Marla S made a good point, which I think is good to bear in mind if one aspires to cohabitate and marry. The gist of it is: when you are living together, you’re thinking about I: “Can I live with this person?” But for a healthy marriage, you need to be intent on adapting your life to your relationship with your partner: you need to be thinking about we: “Can we realize our common dreams?” There’s a difference that should be considered when moving from cohabitation to marriage. It is the difference in mind-set, I think, moving from being a self-centered adult to a founding member of a new family, that gets you in practice for being a parent. I think a lot of people must get tripped up, since becoming an adult is about moving from dependency to being independent, and being married and starting a family is about moving from independence to interdependence. (And then having kids adds never getting enough sleep, changing diapers and the occasional trip to the emergency room.) It takes a lot of character building and revision, just when you thought you had it all figured out . . . a lot of folks I know seem content to stay at “adult” and are reluctant to venture much further. 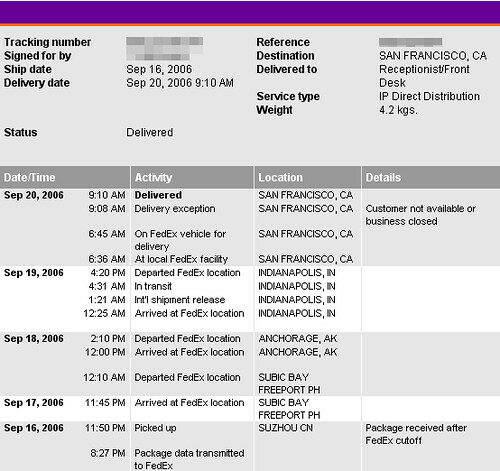 The Mac Shipped ’round the World! So, I’m in San Francisco, and Apple HQ is just a ways down the peninsula. So, what happens when you order a laptop through their store? It ships from the factory in China to the Philipines, and then to Alaska. Well, Philipines seems a bit of a detour, and Alaska seems a bit more indirect, but then it is flown to Indiana where it is inspected by customs. From Indianapolis it is a straight shot to San Francisco. On the one hand I am enchanted by the globe-trotting nature of the Macintosh computer. On the other hand, I wonder how much jet fuel is being wasted by flying products from hub to hub to hub to hub in this manner. Maybe fossil fuel is still too cheap. The night before, I had poured myself a beer, but was then distracted by more important affairs. The next day I had a neglected glass of Sierra Nevada Brown Ale resting on my counter. I boiled my last garlic-basil pork sausage in the beer, while I sauteed onion and red bell pepper. The beer boiled over a bit, so I let the heat down. 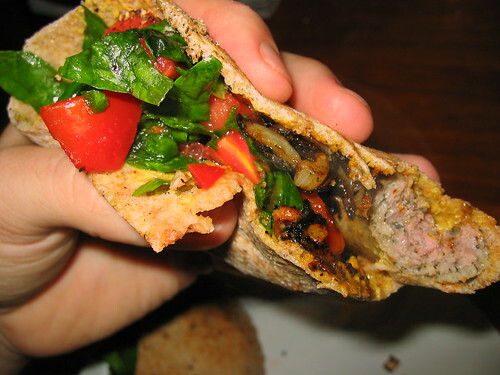 I chopped up a roma tomato and a handful of spinach, tossed the sausage in the frying pan with the onions, and split a wheat pita, coating the inside with spicy mustard. I realized that everything was not going to fit in a single pita, so I had to cut the hot sausage in two, making me a pair of pita pockets. I knew this was good stuff so I took pictures, and now that I see the pictures, I am filled with a craving nostalgia. Gosh, that was a delicious meal! Scenario: a Linux system with two drives. The system was built with resiliency as a priority, but availability is not critical. So, the filesystems were mounted atop md raid1 for resiliency, and the swap was striped across an md raid0 for performance. When I worked at the Pizza Place there was an endless supply of thin white cotton towels. After use they would be tossed in a hamper and swapped out with a weekly laundry service. One day I asked Jefe for a dish towel. “Deesh towels!” he mocked my queer midwestern vocabulary in his Mexican accent. To Jefe, these “dish towels” were rags. I was just thinking about it, and back home we had a “rag bag” in the laundry closet, which was populated by torn or stained old sheets, pillowcases, shirts, and the occasional underwear. I guess if you’re running a restaurant, you want to set a certain standard for rags. Though, I have heard that in developing countries, underwear is considered an acceptible rag for restaurant use. Nowadays, I buy cheap little dishtowels by the dozen from the big box or hardware store. I’m too snooty for a rag bag: defunct textiles are retired to the trash. Somewhere in the midwest, the ancestors are weeping over my flamboyant lifestyle. Talk – Is Yelp Elitist? When it comes to social networking, I prefer to interact with articulate people. Grammar is one benchmark. Style and panache go a long way too. Passion is another element of good writing. So, yeah, Yelpers will tend to embody some combination of erudition, style, panache, and passion, and that stuff makes me hot! I like that Yelp is not MySpace. There’s a “cover charge” here and that is comfort with written self-expression. Of course, this is my personal view. I am not speaking for my employer. Life is better in pairs. I ache . . . but I also contain myself. Is a joyous moment that lasts forever.